Get started with Sigma by making your first Worksheet! A few clicks and you’ll be on your way to easily performing complex analysis on your data. 1. Click the plus sign on the left hand navigation bar. 3. Choose if you would like to important data from a Table, Worksheet, or Custom SQL Query. Tables: imports data from your connected data warehouse. Reference: creates a dependent copy of an existing Sigma Worksheet. Custom SQL: allows you to execute a custom SQL Query to call data from your connected data warehouse. 1. Click on Table as a data source. 2. You can choose where your data comes from using the menu on the left. 3. Use the check boxes on the bottom right to choose which columns to import. 4. One the right, you can see a preview of the data in the columns you are importing. 5. 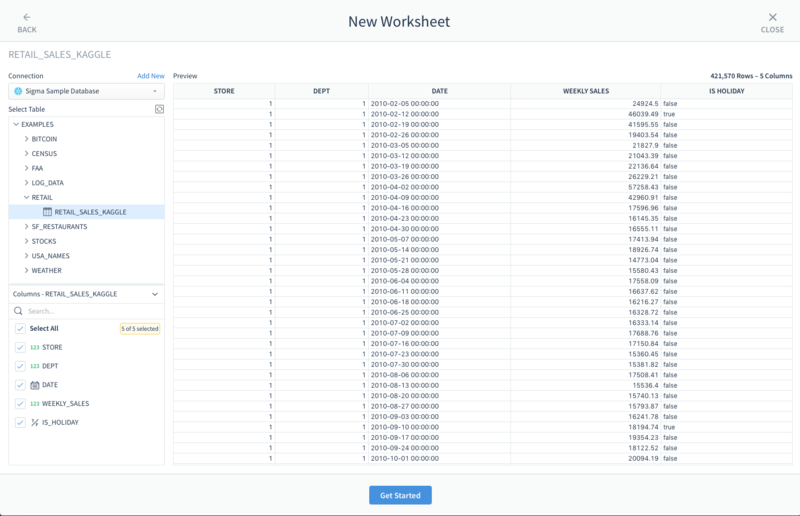 Hit Get Started to create your worksheet!